Moon & Stars Totem was designed by Roxi Phillips. Learn how to make fun Fall decorations by exploring more seasonal spray paint projects from Krylon®. Determine the order in which the pumpkins will stack with largest as the base and progressively smaller to the top. With a paring knife, carefully cut the stem off all but the top pumpkin, leaving a 1” hole. Cut a 1” hole in the bottom of all but the bottom pumpkin, allowing the pumpkins to be threaded onto the dowel. 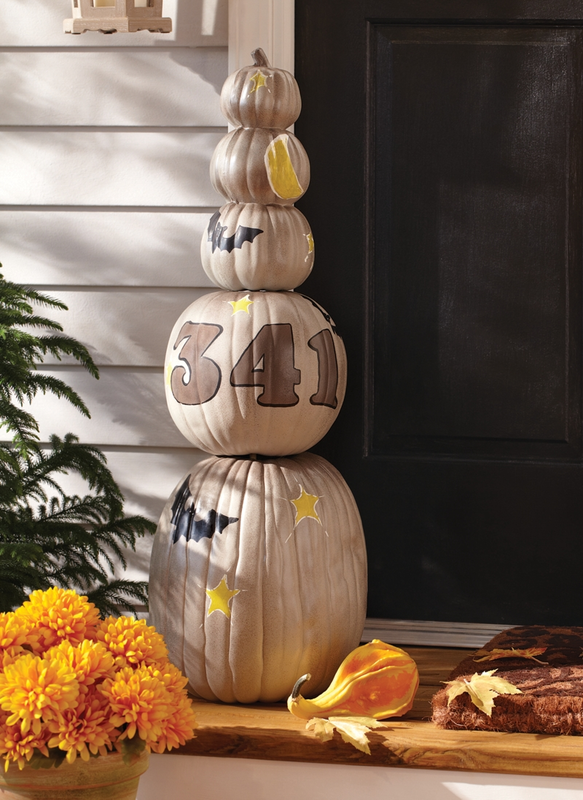 Spray paint the individual pumpkins with Krylon® Fusion® in River Rock; repeating coats as necessary for complete coverage. Allow to dry. To add texture and dimension, spritz tops and bottoms of pumpkins lightly with Krylon® Fusion® in Chocolate Brown Hammered, allowing paint to mist onto the foundation coat of Fusion® River Rock. Position number stencils onto one of the pumpkins, masking off all areas not to be painted. Spray numbers with Krylon® Fusion® in Chocolate Brown Hammered; allow to dry. Using various halloween themed stencils, trace designs onto pumpkins, or draw them free-hand. Using Krylon® Paint Pens in Black, White, and Sun Yellow fill in and outline designs. Outline house numbers with black. Add sand to bottom pumpkin and insert dowel into sand. Thread other pumpkins onto dowel. Note: you may need to cut the dowel to fit the height of your totem.